There is, according to Labour MP for Nottingham South, Lillian Greenwood, only one joke about buses, which is that you wait an age for one and three come along at once. 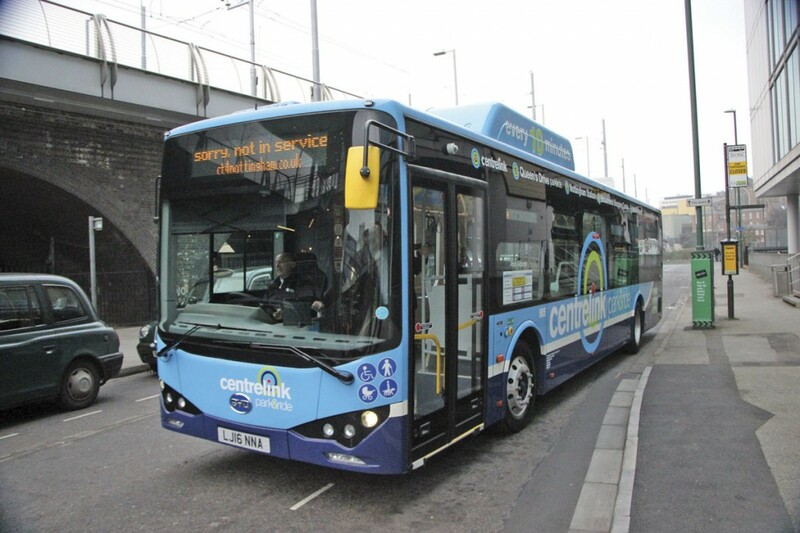 This was one of those occasions when its use was reasonable as the 13 BYD e-bus 12m electric buses delivered to Nottingham Community Transport (Nottingham CT) were ordered as long ago as the beginning of 2015 and won’t finally enter full service on the routes for which they were purchased until 30 January 2017, though all have been delivered since September and one made an appearance at the Showbus rally in that month. 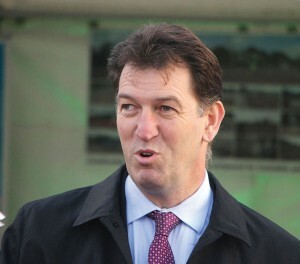 Funding for the vehicles has been provided from two sources: The Government’s Green Bus Fund has coughed up £1.4m and Nottingham City Council’s (NCC’s) Workplace Parking Levy which is either a great way to fund local transport improvements or an unwarranted tax on local employment, depending on your point of view, has provided a further £2.1m. They have been purchased for use on NCC’s contracted Link services with effect from 30 January 2017. 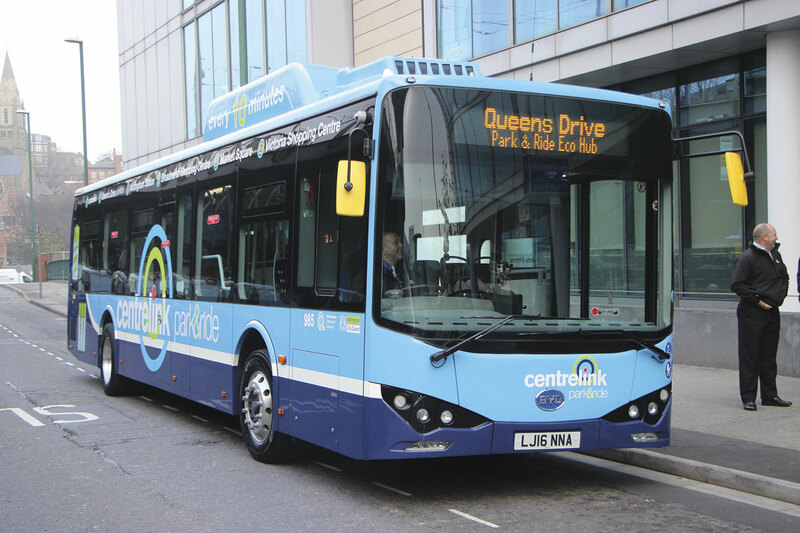 Five are branded for and will be used on the Centrelink park and ride route between the 1,000-space Queen’s Drive Park & Ride site on the ring road to the south west of the city and Nottingham City Centre. 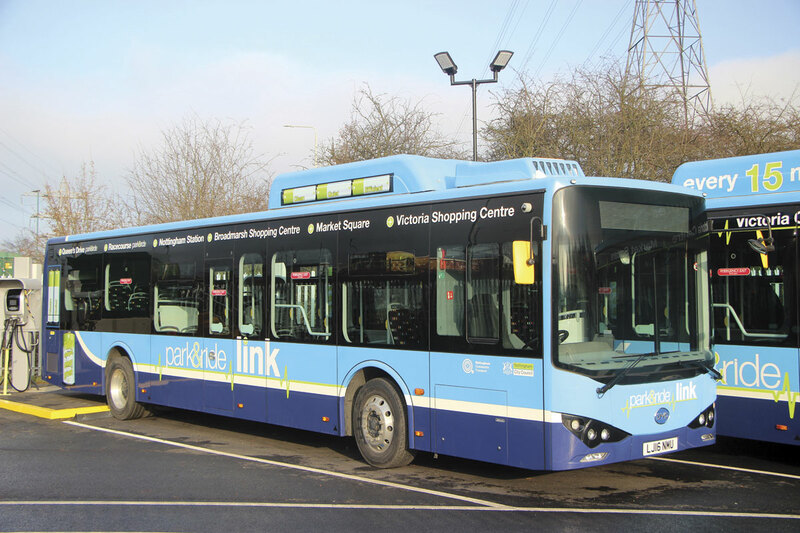 This service, at present known as Citylink 1, incorporates the former Centrelink service and provides links to the Broadmarsh and Victoria Bus Stations as well as the main rail station, Theatre Royal and main shopping areas. The service enjoys extensive bus priority including some traffic light priority, a dedicated bus lane and long sections of bus only road. Some sections of shared space with pedestrians are planned for the future. 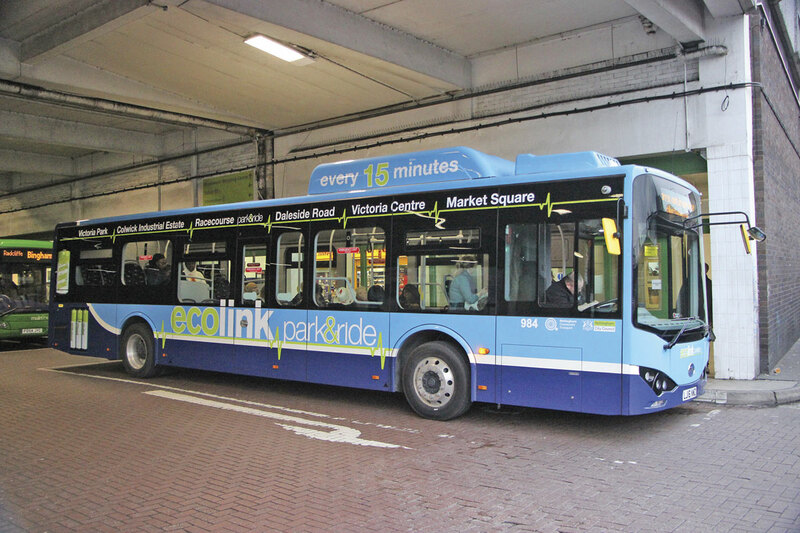 Nottingham CT has been operating the park and ride since 31 October this year using three Optare Solos, so the five BYDs will represent an increase in both provision and capacity. Provision is every ten minutes from 06.00 to 19.30 Monday to Saturday. The remaining four BYDs are spares and have been branded park&ride link enabling their use on either route. 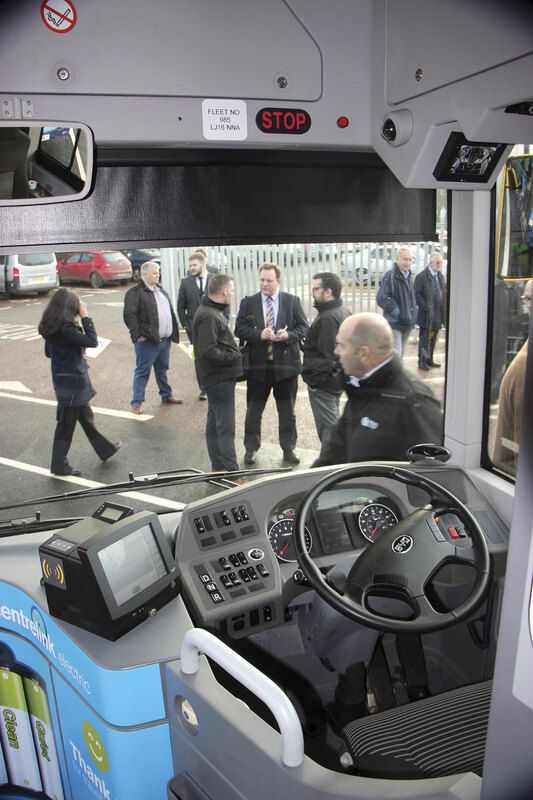 A launch event was held at a new separate depot area for the BYDs at the Queens Drive park and ride site where Nottingham CT already has a depot and charging facilities for a number of its vehicles. After Frank’s speech there were photographs taken of the ten children from Wellbeck Primary School who were the winners in a competition to design posters promoting green bus travel. Each child held up their picture and they had clearly grasped what it was all about with some excellent designs. 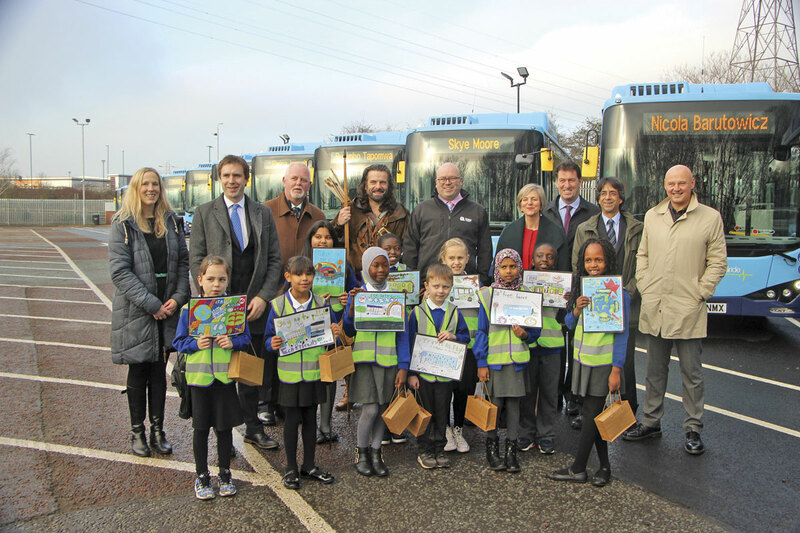 As part of their prize they not only got to attend the launch and be one of the first to travel on them, but each child is also having one of the buses names after them. For the event this was displayed on the front destination but I understand it is to be permanently carried on the side of the bus. 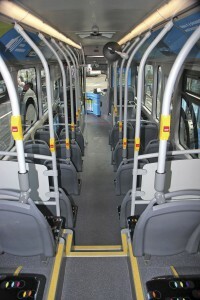 The buses are 12m BYD e-buses built in China. Nottingham CT’s BYDs differ tremendously from the first two examples supplied to Go Ahead in London. The large battery packs immediately behind the driver on both sides of the aisle made the London buses very claustrophobic, but their absence means that is not the case on these. True, the profusion of handrails does make them rather more internally congested than some single deck designs, but though they have a characteristic Chinese look to those in the industry, passengers are not going to notice. They have two battery packs at the rear of the bus and inside there is seating for 40 including five tip-ups, with a 35 standee capacity. Handrail provision is extensive, and while this is in contrast to some recent high profile deliveries, my guess is that older passengers in particular will prefer it. In slight contradiction to their low emission credentials they have diesel powered Webasto heaters but BYD is working on offering full electric alternatives. A BYD spokesman confirmed that these are likely to be the last BYD buses with Chinese built bodies supplied in the UK as future ones will be built in conjunction with ADL. I understand the intention is that the joint product range will be extended to cover sectors of the market that are not currently covered, with a 10.8m version already announced. 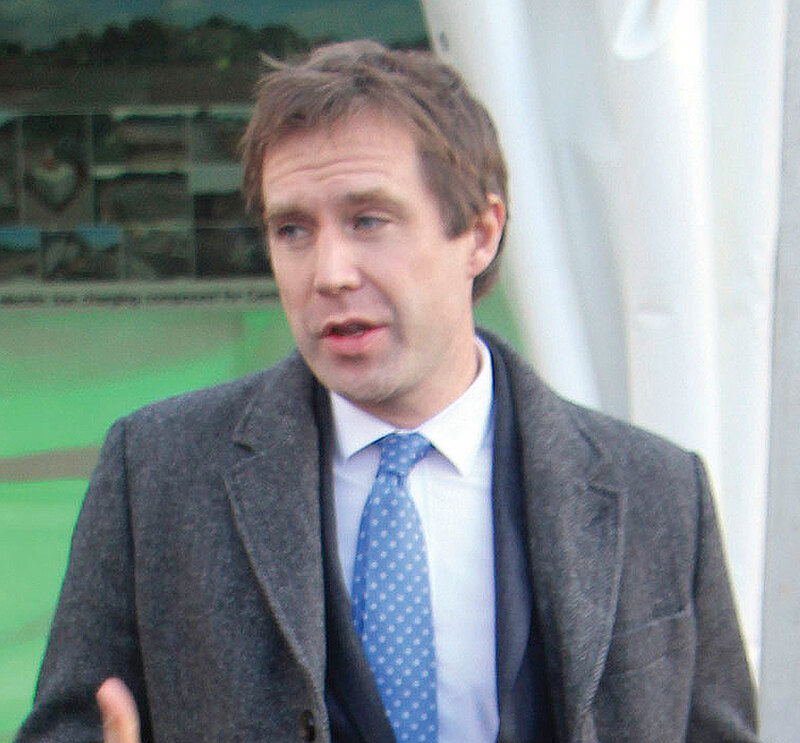 I rode to the event on one from Nottingham’s offices opposite the railway station to the Queens Drive Park & Ride site and it was an enjoyable experience. There was a slightly more pronounced whine from the electric motor than I had expected but the quality of the ride, while quite firm, was as comfortable as the roads would allow it to be. It appeared to accelerate well and felt very stable with extremely smooth application of the considerable power. My only surprise was the condensation that formed on the ceiling panels where there was metal structure behind. In concept, the BYDs are very different to the large fleet of Optares that the business already operates. The Optares have relatively small 95kwh battery capacity whereas the BYDs have a 345kwh capability. 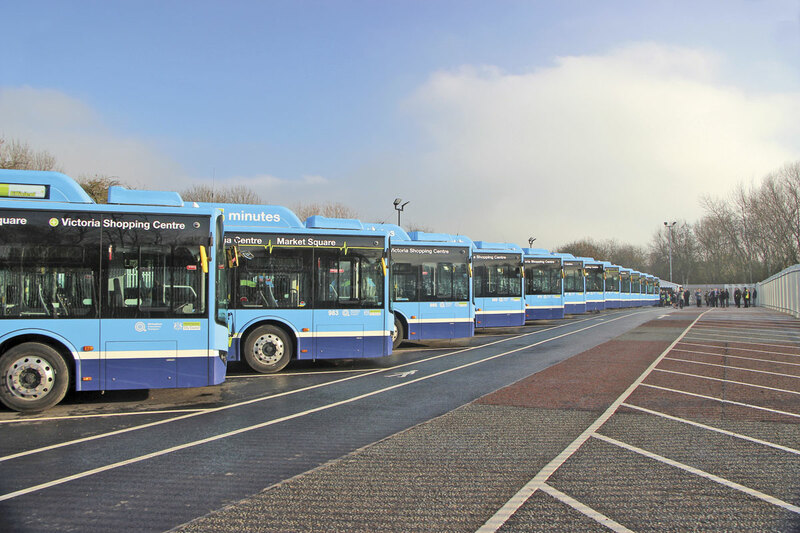 Frank Thorpe told me that the buses had a range of approximately 150 to 170 miles on a daily charge which will ensure that there is never any need to bring them back to the depot for opportunity charging during the day. He explained that BYD do not usually claim a range figure, they prefer to talk in terms of a 16 hour working day capability. The average duty cycle for the routes the BYDs are covering is between 100-110 miles. They are being supplied with a five-year warranty on the power train components which are based on the company’s Iron-Phosphate battery technology. BYD also supplied the DC charging equipment. 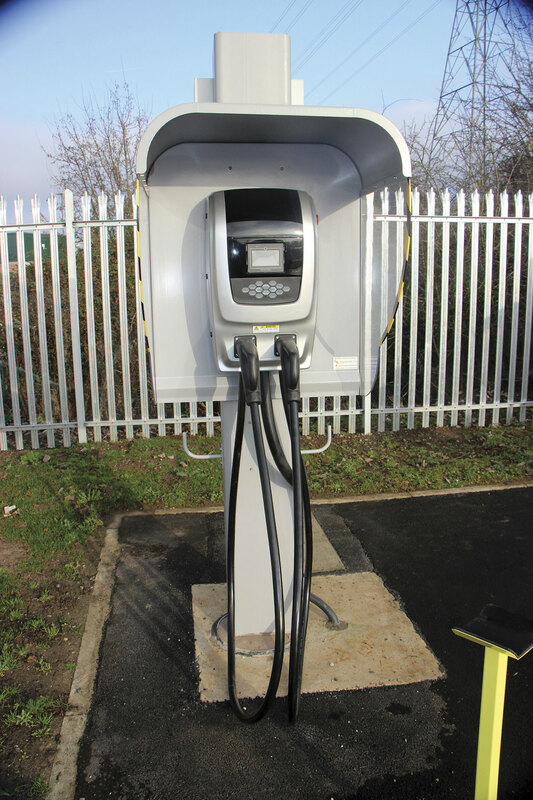 Each bay has a charging unit with two charging leads, each delivering 40kw power. 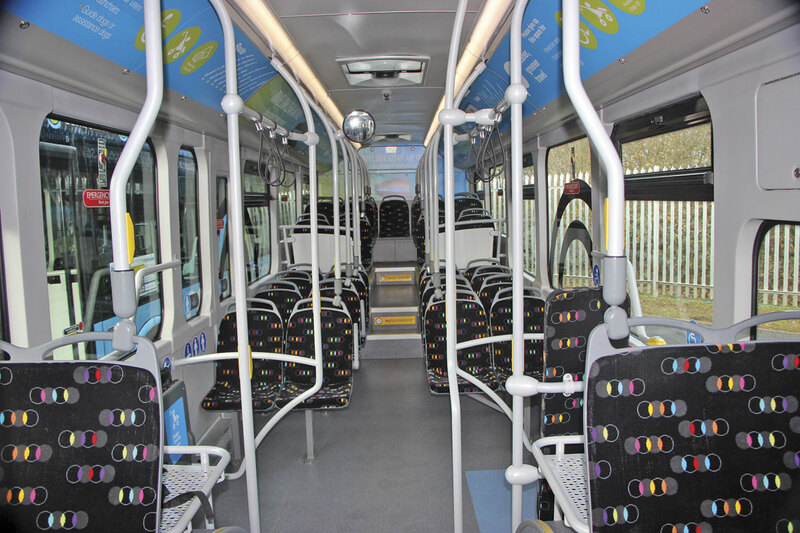 Each bus has two charging ports which enables two leads to be used at once increasing the rate of charging to 80kw. The only problem I could see with the system was that sun on the unit’s display (briefly) made it difficult to read. You may well have read about Nottingham CT in my report on the Total Transport North Group Doncaster event (B&CB issue 1406, 25 November 2016) at which General Manager, Ian Combellack, was one of the speakers, so it was interesting to see a significant part of the operation, though not the operation’s headquarters at the Sherwood Bus Garage on Mansfield Road in Nottingham. Said to be the biggest electric fleet in Europe with a total of 58 full electric buses, all previous electric acquisitions have been Optares. Of the 45, ten are 10.2m long Versas and 35 are 9.8m long Solos. 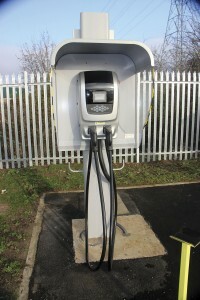 Existing charging facilities include two fast chargers and ten trickle chargers at the Sherwood site while the original Queens Drive parking area has 25 trickle chargers and three fast chargers. A further three fast and seven trickle chargers are to be added to this. The trickle chargers in this area are basically just 400volt/50kW DC three phase supplies as the Optare buses have on board chargers. 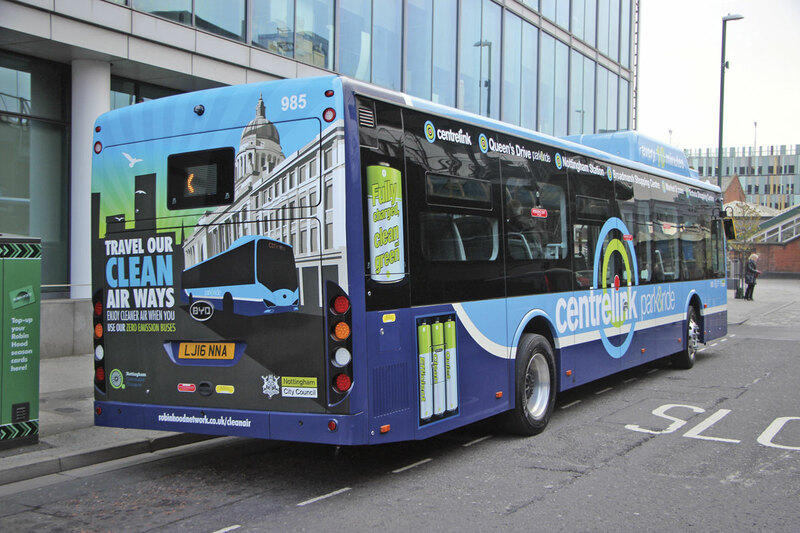 Steve Cornes, NCC’s Electric Bus Project Manager, revealed that, with the oldest electric buses now around four years old, the batteries were lasting ‘loads better than we thought.’ To date, no noticeable battery degradation has been encountered. It takes six and a half hours to fully charge an Optare overnight, two hours longer than it takes to fully replenish a BYD battery. The operations team are delighted with a new telemetry system that has just been installed to make running the fleet easier. 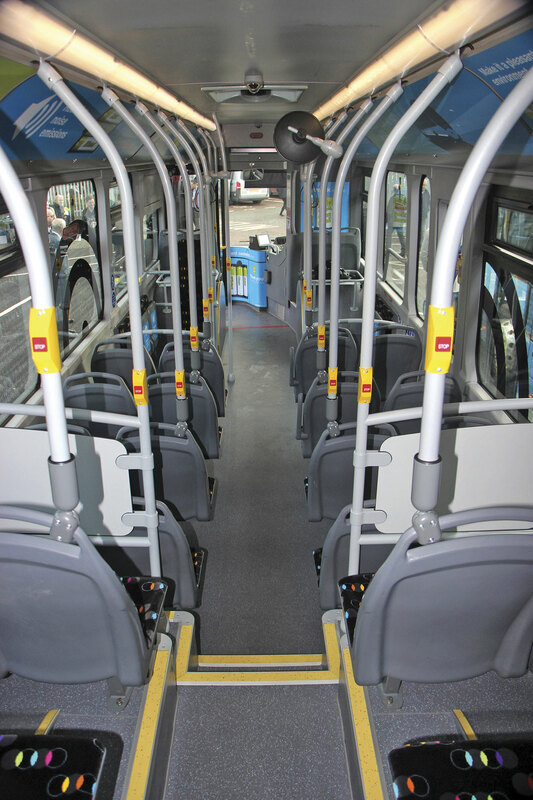 The Dutch Viriciti system was initially installed on a trial basis on two of the Optare Solos last year and has subsequently been specified for all 13 of the BYDs. Plans are in hand to equip all of the other Optares with the equipment. 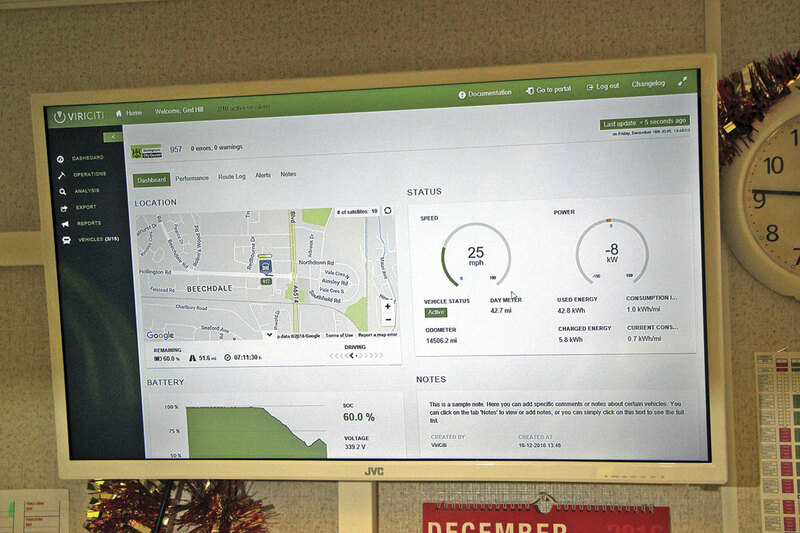 It updates every five seconds giving the precise location of the bus shown graphically on a map, which is very useful, but the real boon is the ability to capture live data on all aspects of each vehicle’s performance including the state of the batteries, whether it is regenerative braking or accelerating and using power or if it is stationary. Using this telemetry information, taken straight off the battery management system, the team can very precisely manage vehicles and monitor their charging needs. 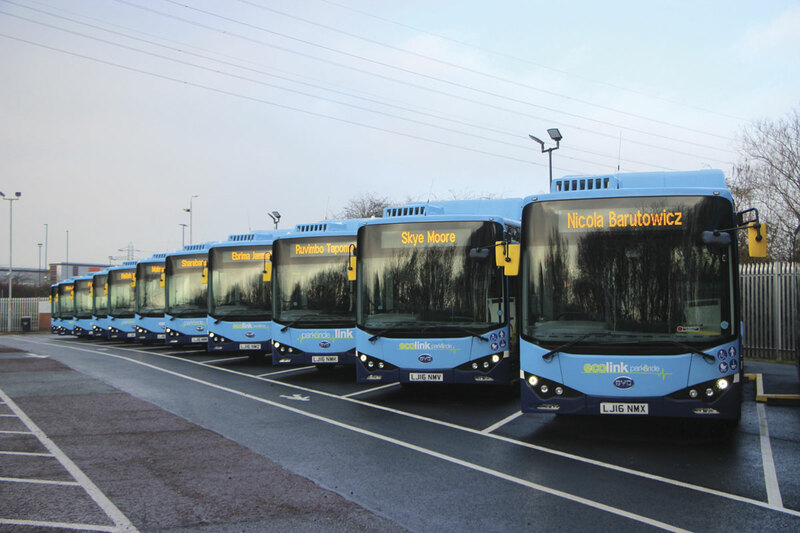 Were a bus to have had a heavy morning duty, it would enable them to determine whether to switch it to a less onerous duty in the afternoon rather than requiring the driver to bring it back to depot for recharging. This should not be an issue with the BYDs which are set up to operate all day and charge overnight, but for the Optares which I was told have a range of approximately 70 miles and are often in need of opportunity charging part way through the day, it has the potential to increase utilisation and either provide more services or reduce the number of buses needed. 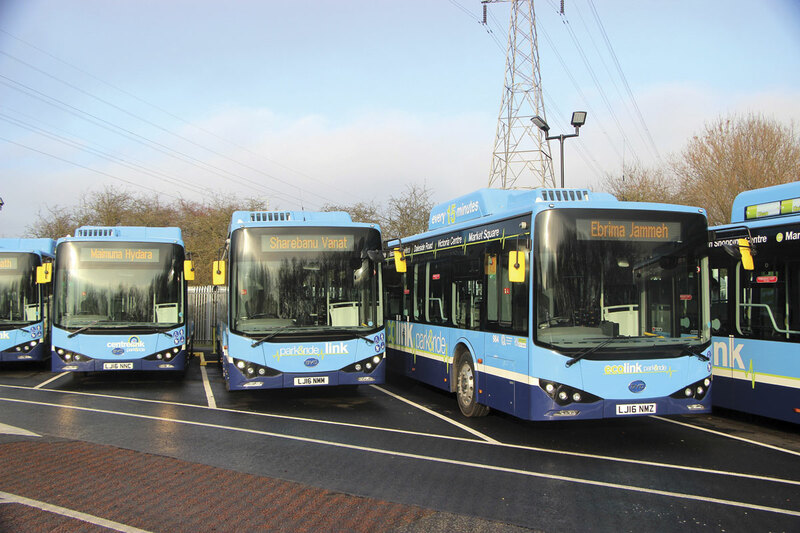 Normal practice with the Optares is not to take them beyond 75% of their range, partly because drivers are range anxious and partly because of the high cost of getting an electric bus recovered, you can’t just pour some electricity in! Another interesting aspect of the original Queens Drive site is that the extension to it has porous tarmac to protect the roots of the trees alongside which means that no puddles form in it. 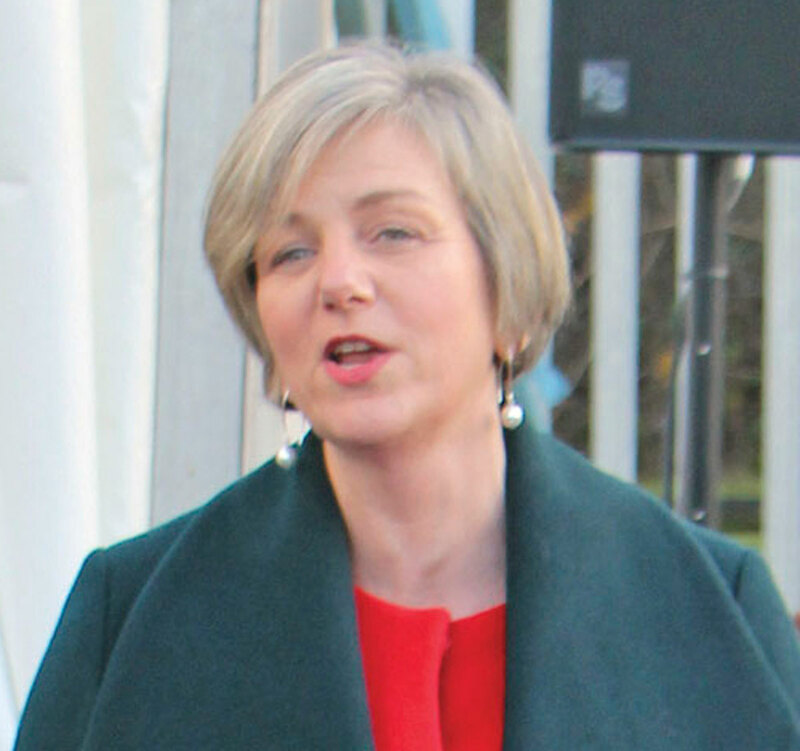 Actually, Lillian Greenwood was wrong, there are other bus jokes. One of my favourites is the old one about the driver newly promoted to handle one person operated buses. After his double decker was involved in an accident on his first journey out he explained, I have no idea how it happened, I was upstairs collecting the fares at the time!